Today is the first day of spring, and what better day to launch the Suburban Farm? Join me and my family as we grow food on our small patch of land in suburban New England. We’re like a lot of our neighbors: we both work full-time, and we have a household to manage. We don’t pretend to know exactly what we’re doing in the garden. But you can learn with us as we try to take a little more responsibility for our food. Winter in Connecticut has been long and gray. The spaces where the gardens grow are matted with leaves and are virtually indistinguishable from the colorless landscape. But signs of life are beginning to peer through. 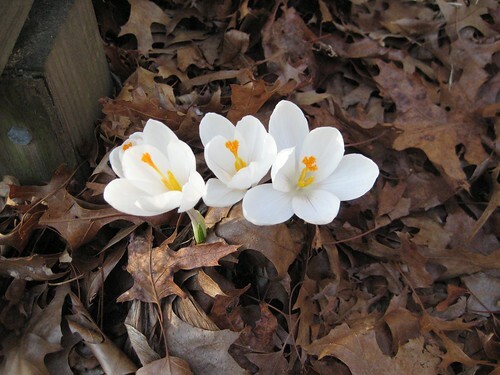 Crocuses among leaves, March 2009. The arrival of the crocuses and daffodils are my signal to start planning this year’s plot and satellite growing areas. Paging through the seed catalogs really is a lot of fun. Every year there are exciting new hybrids and fantastic blooms that make my head spin with ideas. But this year I’m going to make a conscious effort to incorporate as many heirloom varieties as possible into my plans. I haven’t completely formulated my position on GM agriculture, but I feel compelled to help preserve our agricultural history, and support the small farms who save and distribute seeds every year. Over the next week I will put together a list of seeds or plants to buy, survey my family on what kind of produce they’d like to see added to this year’s crop, and consider which new areas of the yard can be acquired for edible gardens. What are you doing to plan for this year’s garden? Share your ideas in the comments section. Congratulations on the launch of your site! I look forward to reading it!